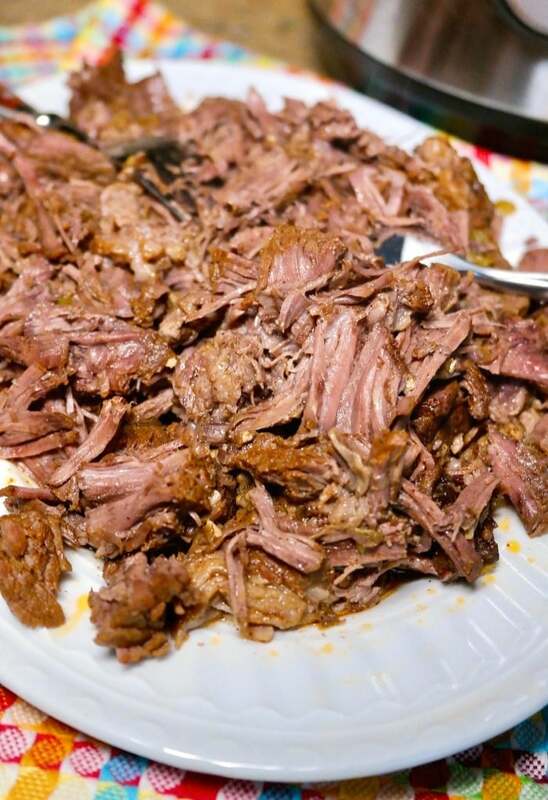 This shredded beef recipe is made in an Instant Pot! 35 minute dish seasoned with Latin spices for all your Mexican dishes like street tacos, tostadas or enjoy over a bed of fried cabbage for a low carb meal! If you haven’t invested in a pressure cooker yet, it’s time to add it to your birthday or Christmas gift list! I’ve had my Instant Pot for several month and each time I use it I’m always thrilled with how quick a dish comes together. Such a timesaver! 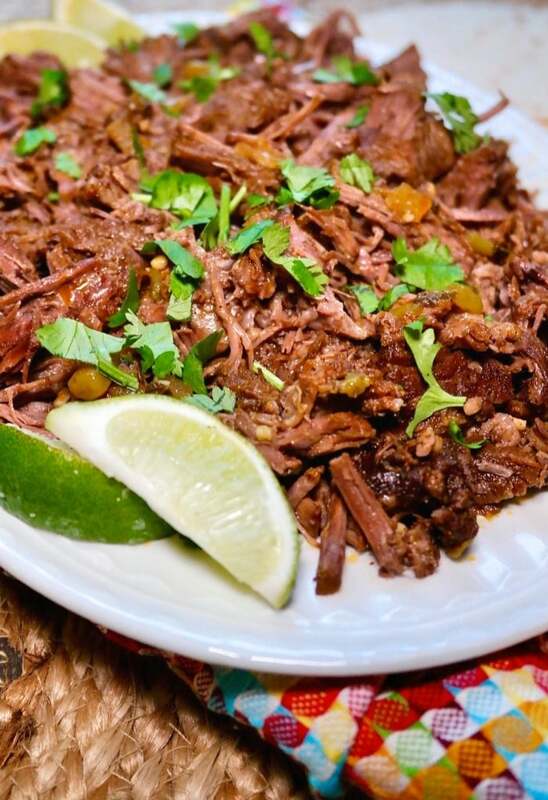 This Mexican shredded beef recipe is no different. 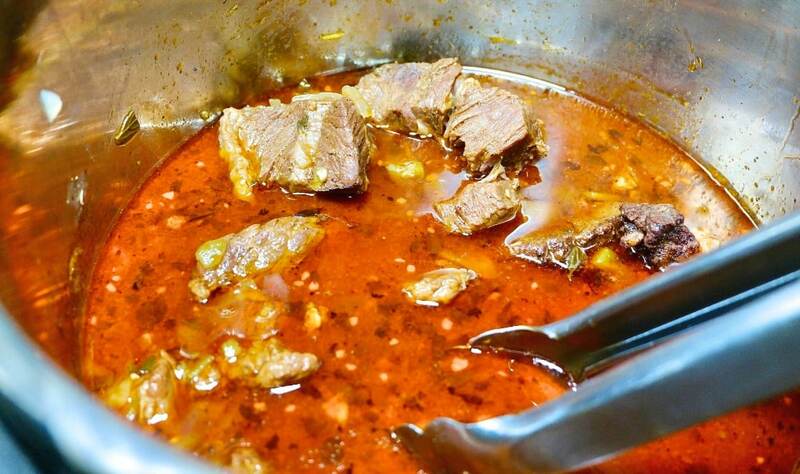 Add all the ingredients and let the pressure build up tenderizing and flavoring the meat to perfection. To make this dish, first cut the beef into small 2-3 inch chunks. Whisk together the spices; chili powder, cumin, salt, Mexican oregano and sprinkle it over the meat. Use your hands to work in the spices making sure each piece is seasoned well. Turn off the saute mode and add the remaining ingredients and set the IP to manual mode for 35 minutes. Walk away and let the magic begin. After the meat is cooked you’ll notice lots of juice is rendered. I like to save some of it to make homemade gravy to serve with the beef and Mock Mashed Potatoes. Taquitos to name a few! My favorite way to use this beef is in tacos. 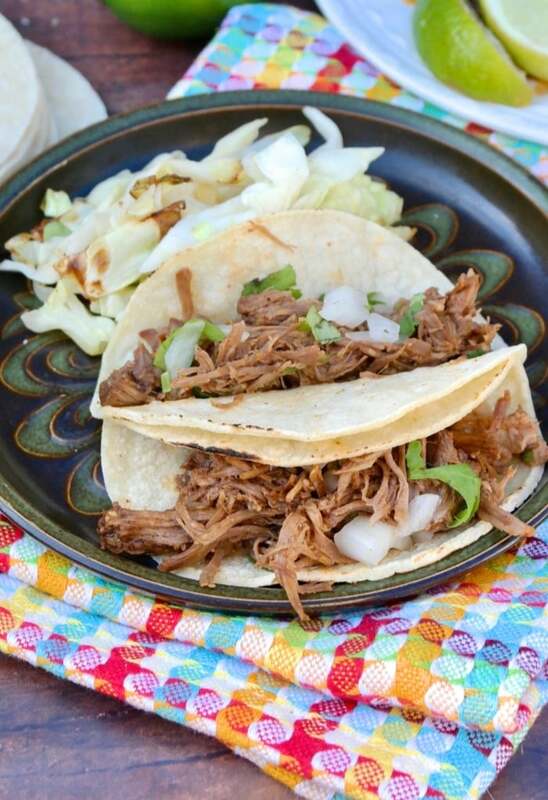 The meat for tacos stretches to a lot of servings, which is great since everyone loves tacos! To serve street tacos all you will need is mini corn tortillas, diced white onion and cilantro. How easy is that for entertaining?! For a low carb option serve this shredded beef with fried cabbage seasoned with salt and pepper! Boy, such a simple and tasty combination. 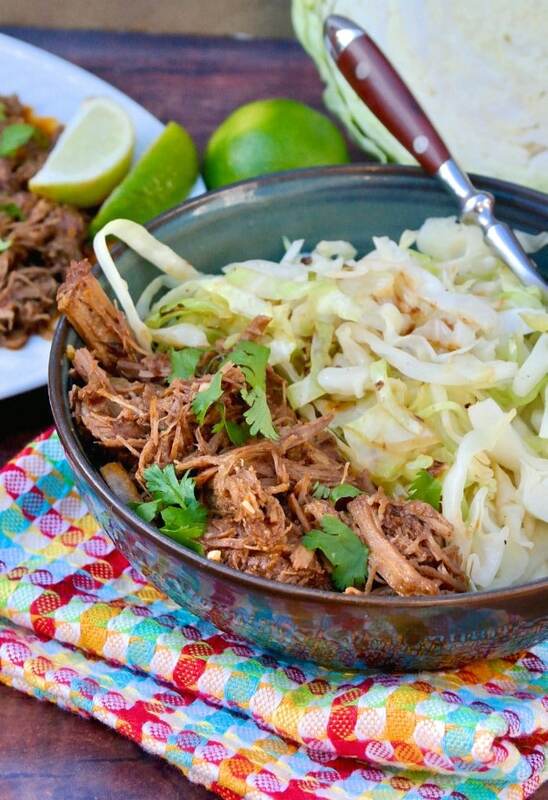 Follow the first step in the Tex-Mex Cabbage Beef Skillet recipe for instructions on how to saute the cabbage. Do you happen to have other ideas on ways to serve this beef? Let me know. I would love to hear about it! 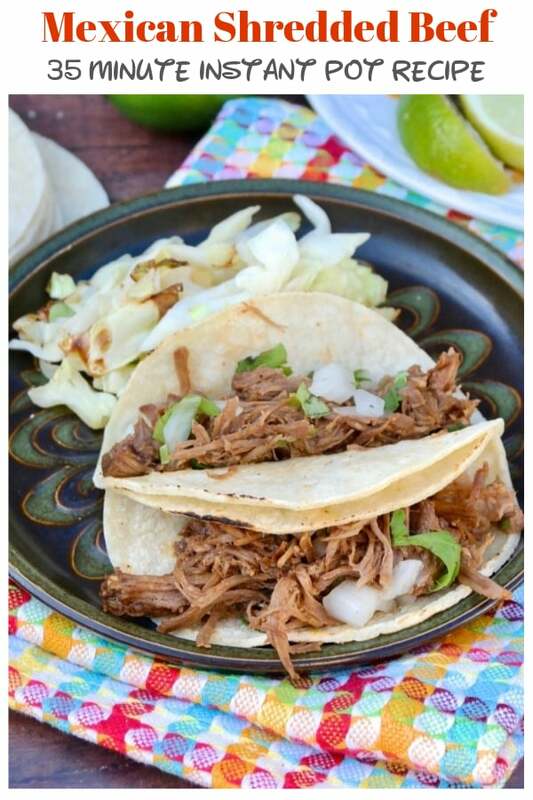 This 35 minute recipe yields tender and flavorful meat for all your dishes that call for Mexican shredded beef. 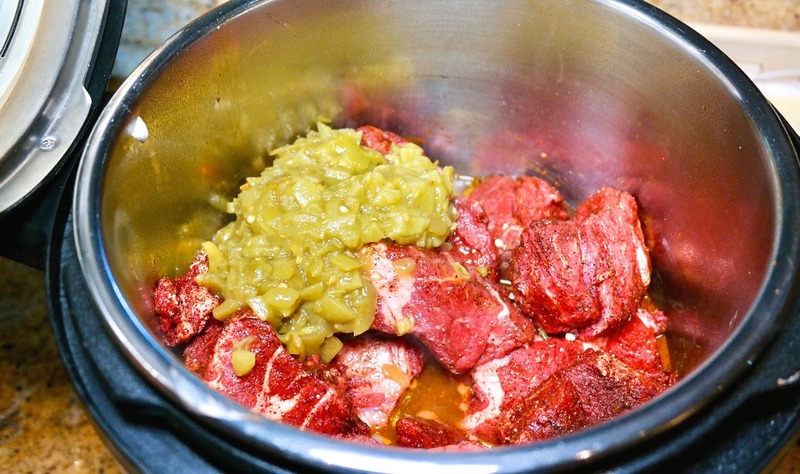 Cut beef into 2-3 inch chunks and set aside. In a small bowl whisk together chili powder, 1 teaspoon cumin, garlic, oregano and salt. Season meat and massage spices into the beef with your hands. Place avocado oil in Instant Pot and turn it on to saute mode. Cook onion until it begins to soften. Add the remaining teaspoon of cumin and stir until fragrant. Turn off the Instant pot and add the meat and remaining ingredients; broth, tomato paste, green chilis OR tomatoes with chili. Lock the lid and press the meat/stew mode. Cook on high pressure for 35 minutes. Once complete, let the pressure release on its own. Remove meat from Instant Pot and place on a platter. Shred beef with two forks. Sometimes I use all green chilis and other times I'll add tomatoes with green chilis like Rotel. We have some tortillas in the fridge. I may need to make some of this to fill them up! I love how tender meat gets in the instant pot. Great recipe! 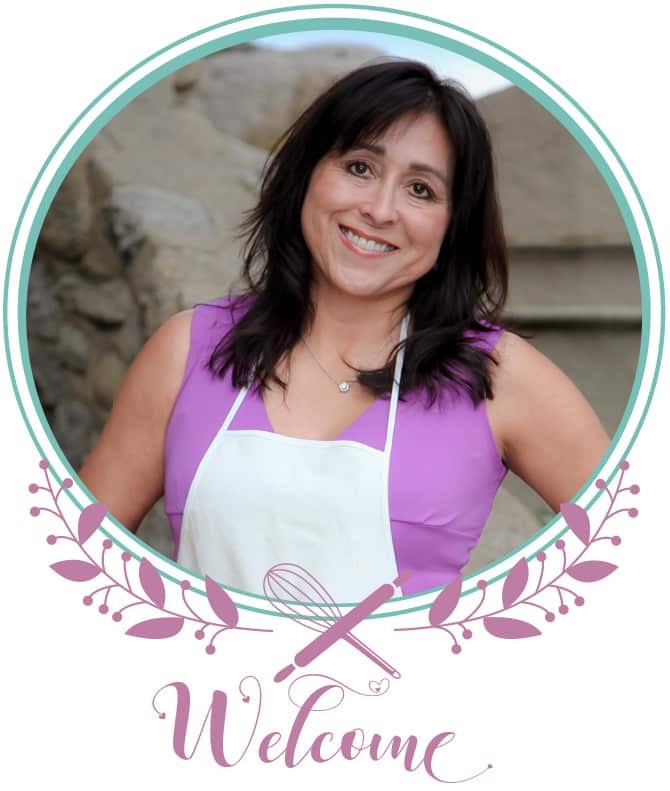 Your Mexican recipes are some of my favorites on your blog, I know this one will be no different!! I am trying it Tuesday!! Thanks you!! I love making a batch of shredded beef! I use it for breakfasts, lunches in my quesadillas, and then in tacos and burritos as dinner! So many uses for it. Also in quick appetizers! 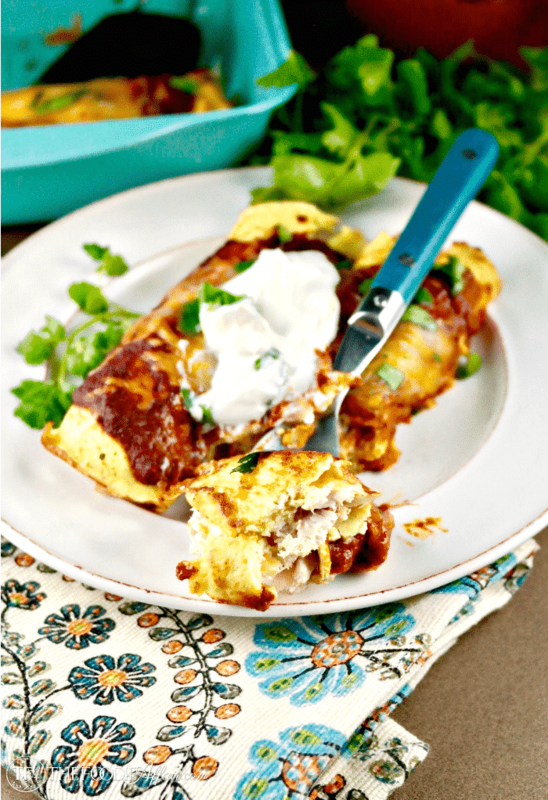 Yes, shredded beef is super versatile! Love it and how simple it is to make! This looks so amazing! I love how quick and easy this is to make!